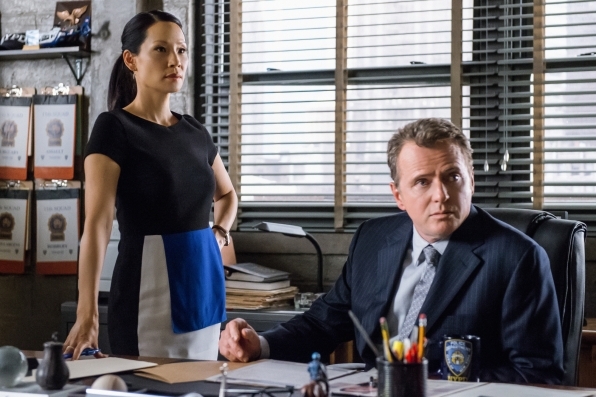 Previously on Elementary: The Diabolical Kind. Welcome home, Detective Marcus Bell. To assuage the worries of many Elementary fans: no, Jon Michael Hill is not leaving, and either is his character. Bell did indeed transfer to Demographics, the New York law enforcement agency for counter-terrorism. Aside from the friction between Bell and the two consulting detectives, the episode also briefly touches on the public bias displayed in the tips that are being called in — an overbalance of people of colour being accused of doing shady stuff in shady back alleys where there, in fact, aren’t any shadows to be seen. The NSA also gets their own back, by way of Sherlock being very well aware that the web development firm he and Joan are visiting helped build PRISM, the programme used to spy on everyone and everything. The core of the story is Sherlock and Bell’s relationship, however. After his transfer, Joan and Sherlock have worked with several detectives, none of them good enough. Joan reassures Sherlock that Bell will eventually forgive him, but it’s not only that that’s making Sherlock anxious. Of course it’s his wish that Bell forgive him, but he’s ok with the possibility that Marcus might never do that, and that they’ll never be friends again. What he can’t stand to see is that, in his opinion, Marcus is selling himself short and giving up on his recovery too soon. Above all, Sherlock wants to see Marcus live his calling of being a detective. He holds his skill and intelligence in the highest possible regard — it’s not often that Sherlock Holmes tells you that he believes you can do and achieve anything you set your mind to. It’s one of the greatest things to believe of another person, that they can overcome anything. Sherlock believes that of Bell, and reminds him not to let his desire to get away from Holmes interfere with what he really wants, and what he’s really capable of doing. Bell thought that it was Sherlock’s selfish desire to be absolved of his sins by Bell that compelled him to keep badgering him and that is why he was resisting, but he was wrong. Sherlock saw that Marcus was unhappy, and he hated it. Sherlock hardly ever calls anyone by their first names, but here he does, and Marcus knows. He knows that Sherlock being informal and paying a heartfelt compliment in one breath doesn’t happen every day. What’s even more important is Sherlock’s disclosure of being a drug addict. Bell refused to accept Sherlock’s advice because, arguably, Sherlock doesn’t understand what it’s like to be ordinary because it all comes so easy to him — but Sherlock does know that this isn’t a puzzle to be solved. It’s hard physical, mental, and emotional work, and he’s got Joan to thank for getting better. Sherlock knows it’s an uphill battle, and that, along with his expression of unselfish desire for Marcus to get better, is what makes Bell consider his theory. It’s what makes Bell break into his new commander’s office, it’s what makes him remember that Sherlock is very often right, and that Joan wouldn’t have let Sherlock manipulate him with this if she didn’t think the theory viable as well. In the meantime: all the awards to Joan Watson for providing the material that literally broke this case wide open. It’s telling that it’s her who shouts for Sherlock to come to her room because she found the suspect — not the other way around, Sherlock busting the door down with a deduction that he can’t wait to present.